Science for the Citizen is ... also written for the large and growing number of adolescents, who realize that they will be the first victims of the new destructive powers of science misapplied. Science for the Citizen: A Self-Educator based on the Social Background of Scientific Discovery (1938), Author's Confessions, 9. A fateful process is set in motion when the individual is released “to the freedom of his own impotence” and left to justify his existence by his own efforts. The autonomous individual, striving to realize himself and prove his worth, has created all that is great in literature, art, music, science and technology. The autonomous individual, also, when he can neither realize himself nor justify his existence by his own efforts, is a breeding call of frustration, and the seed of the convulsions which shake our world to its foundations. In The Passionate State of Mind (1955), 18. A lecture is much more of a dialogue than many of you probably realize. “You must be an engineer,” says the balloonist. In Jon Fripp, Michael Fripp and Deborah Fripp, Speaking of Science (2000), 199. In Max Planck and James Vincent Murphy (trans. ), Where is Science Going?, (1932), 214. As the issues are greater than men ever sought to realize before, the recriminations will be fiercer and pride more desperately hurt. It may help to recall that many recognized before the bomb ever feel that the time had already come when we must learn to live in One World. Before I flew I was already aware of how small and vulnerable our planet is; but only when I saw it from space, in all its ineffable beauty and fragility, did I realize that humankind’s most urgent task is to cherish and preserve it for future generations. 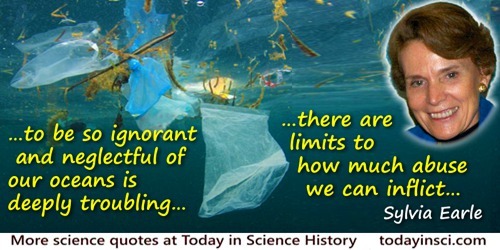 In Jack Hassard and Julie Weisberg , Environmental Science on the Net: The Global Thinking Project (1999), 40. Could the young but realize how soon they will become mere walking bundles of habits, they would give more heed to their conduct while in the plastic state. We are spinning our own fates, good or evil, and never to be undone. 'The Laws of Habit', The Popular Science Monthly (Feb 1887), 451. Do you realize we’ve got 250 million years of coal? But coal has got environmental hazards to it, but there’s—I’m convinced, and I know that we—technology can be developed so we can have zero-emissions coal-fired electricity plants. Remarks at the Associated Builders and Contractors National Legislative Conference (8 Jun 2005). The White house corrected “250 million years” to “250 years” in a footnote to the printed record, 41 WCPD 956 in 'Administration of George W. Bush', 959. Eventually, we’ll realize that if we destroy the ecosystem, we destroy ourselves. In Pamela Weintraub (ed. ), The Omni Interviews (1984), 105. From interview with James Reston, Jr., in Pamela Weintraub (ed. ), The Omni Interviews (1984), 105. Previously published in magazine, Omni (May 1982). His reaction to a harsh, inaccurate, article in the New York Times that questioned the practicality of his goals in rocket research, (1920). As quoted by Dr. Kurt Debus, Director of Kennedy Space Center, NASA, in address (15 Jul 1965) at First World Exhibition of Transport and communications, Munich, collected in Chronology on Astronautics and Aeronautics in 1965 (1966), 332. This is the earliest evidence of this quote that Webmaster, as yet, has found. Please contact Webmaster if you know the primary source. Every well established truth is an addition to the sum of human power, and though it may not find an immediate application to the economy of every day life, we may safely commit it to the stream of time, in the confident anticipation that the world will not fail to realize its beneficial results. In 'Report of the Secretary', Annual Report of the Board of Regents of the Smithsonian Institution for 1856 (1857), 20. How few people will realize how much detail had to be gone into before Bakelite was a commercial success. Diary entry (13 Oct 1909). In Savage Grace (1985, 2007), 65. I believe citizens are beginning to realize that their birthright, a healthy ecosystem, has been stolen, and they want it back. In The End of the Line: How Overfishing is Changing the World and what We Eat (2004), 317. From Theodore von Karman and Lee Edson (ed. ), The Wind and Beyond: Theodore von Karman, Pioneer in Aviation and Pathfinder in Science (1967). I don’t know what your Company is feeling as of today about the work of Dr. Alice Hamilton on benzol [benzene] poisoning. I know that back in the old days some of your boys used to think that she was a plain nuisance and just picking on you for luck. But I have a hunch that as you have learned more about the subject, men like your good self have grown to realize the debt that society owes her for her crusade. I am pretty sure that she has saved the lives of a great many girls in can-making plants and I would hate to think that you didn’t agree with me. Letter to S. P. Miller, technical director of a company that sold solvents, 9 Feb 1933. Alice Hamilton papers, no. 40, Schlesinger Library, Radcliffe College. Quoted in Barbara Sicherman, Alice Hamilton: A Life in Letters (1984). I had observed that there were different lines exhibited in the spectra of different metals when ignited in the voltaic arc; and if I had had any reasonable amount of wit I ought to have seen the converse, viz., that by ignition different bodies show in their spectral lines the materials of which they are formed. If that thought had occured to my mind, I should have discovered the spectroscope before Kirchoff; but it didn’t. 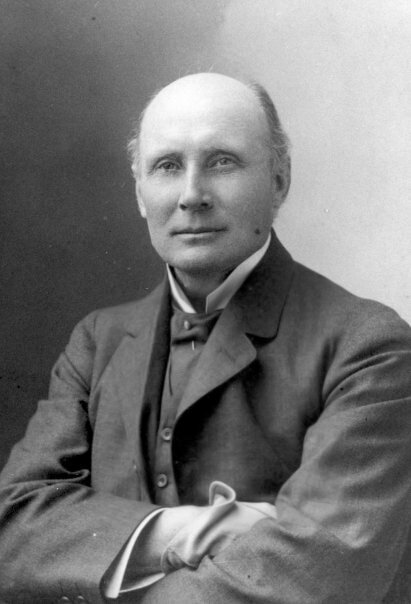 Address, in 'Report to the Chemical Society's Jubilee', Nature (26 Mar 1891), 43, 493. Words as in original text, occured and Kirchoff are sic. I sometimes wonder how we spent leisure time before satellite television and Internet came along…and then I realise that I have spent more than half of my life in the ‘dark ages’! From interview (5 Dec 2003) days before his 86th birthday with Nalaka Gunawardene, published on the internet sites http://southasia.oneworld.net and arthurcclarke.net. I used to think the human brain was the most fascinating part of the body. But then I realised, Well …look what’s telling me that? If I get the impression that Nature itself makes the decisive choice [about] what possibility to realize, where quantum theory says that more than one outcome is possible, then I am ascribing personality to Nature, that is to something that is always everywhere. [An] omnipresent eternal personality which is omnipotent in taking the decisions that are left undetermined by physical law is exactly what in the language of religion is called God. 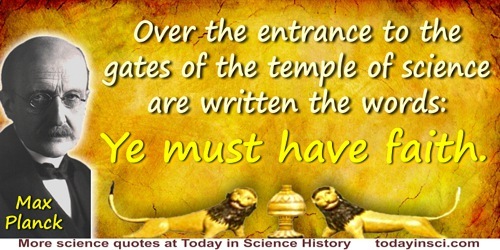 As quoted by John D. Barrow in The Universe that Discovered Itself (2000), 171. In speech to first national meeting of the Association for Computing Machinery (1947), as quoted in Franz L. Alt, 'Archaeology of computers: Reminiscences, 1945-1947', Communications of the ACM (Jul 1972), 15, No. 7, 694. If the potential of modern science is to be realized, there is no alternative to global public goods and institutions. If you dream of something worth doing and then simply go to work on it and don't think anything of personalities, or emotional conflicts, or of money, or of family distractions; if you think of, detail by detail, what you have to do next, it is a wonderful dream even though the end is a long way off, for there are about five thousand steps to be taken before we realize it; and [when you] start taking the first ten, and ... twenty after that, it is amazing how quickly you get through through the four thousand [nine hundred] and ninety. The last ten steps you never seem to work out. But you keep on coming nearer to giving the world something. Victor K. McElheny, Insisting on the Impossible (1999), 1. If you’re telling a story, it’s very tempting to personalise an animal. To start with, biologists said this fascination with one individual was just television storytelling. But they began to realise that, actually, it was a new way to understand behaviour–following the fortunes of one particular animal could be very revealing and have all kinds of implications in terms of the ecology and general behaviour of the animals in that area. From interview with Alice Roberts, 'Attenborough: My Life on Earth', The Biologist (Aug 2015), 62, No. 4, 15. In recent years scientists have grown self-conscious, perhaps because they have only lately become of age. They realize that they are now part of the drama of human history, and they look to the professional historian for background and perspective. (1932). Epigraph, without citation, in I. Bernard Cohen, Science, Servant of Man: A Layman's Primer for the Age of Science (1948), 1. In years gone by, we would just take, take, take from the oceans but today we realize this is not an option, that the oceans keep us alive, and that we need to tread more carefully. This is now both a governance issue and a choice issue. Reginald C. Punnett, in article 'Mendelism', from Hugh Chisholm (ed.) The Encyclopædia Britannica (1911), Vol. 18, 120. It doesn’t take a scientist to realize that a chimpanzee or a dog is an intelligent animal. Instead, it takes a bigoted human to suggest that it’s not. In The Omni Interviews (1984), 73. It has been said repeatedly that one can never, try as he will, get around to the front of the universe. Man is destined to see only its far side, to realize nature only in retreat. In 'The Innocent Fox,' The Star Thrower (1978), 63. It is even harder to realize that this present universe has evolved from an unspeakably unfamiliar early condition, and faces a future extinction of endless cold or intolerable heat. The more the universe seems comprehensible, the more it seems pointless. The First Three Minutes: A Modern View of the Origin of the Universe (1977, 1993), 154. It is important to realize that life on this planet has spent about three-quarters of its existence in single-celled form, and even today the majority of organisms still exist as single cells. The evolutionary pressure to become complex is evidently not very great. 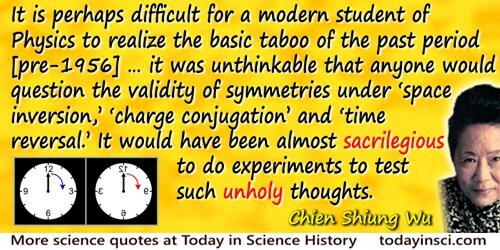 It is perhaps difficult for a modern student of Physics to realize the basic taboo of the past period (before 1956) … it was unthinkable that anyone would question the validity of symmetries under “space inversion,” “charge conjugation” and “time reversal.” It would have been almost sacrilegious to do experiments to test such unholy thoughts. In paper presented to the International Conference on the History of Original Ideas and Basic Discoveries, Erice, Sicily (27 Jul-4 Aug 1994), 'Parity Violation' collected in Harvey B. Newman, Thomas Ypsilantis History of Original Ideas and Basic Discoveries in Particle Physics (1996), 381. It might be helpful to realize, that very probably the parents of the first native born Martians are alive today. Its [science’s] effectiveness is almost inevitable because it narrows the possibility of refutation and failure. Science begins by saying it can only answer this type of question and ends by saying these are the only questions that can be asked. Once the implications and shallowness of this trick are fully realised, science will be humbled and we shall be free to celebrate ourselves once again. From Understanding the Present: An Alternative History of Science (2004), 249. Later, I realized that the mission had to end in a let-down because the real barrier wasn’t in the sky but in our knowledge and experience of supersonic flight. Life is a series of experiences, each one of which makes us bigger, even though it is hard to realize this. For the world was built to develop character, and we must learn that the setbacks and griefs which we endure help us in our marching onward. Many people think that conservation is just about saving fluffy animals—what they don’t realise is that we’re trying to prevent the human race from committing suicide … We have declared war on the biological world, the world that supports us … At the moment the human race is in the position of a man sawing off the tree branch he is sitting on. As quoted in Douglass Botting, Gerald Durrell: The Authorized Biography (1999), 194. My eureka moment was in the dead of night, the early hours of the morning, on a cold, cold night, and my feet were so cold, they were aching. But when the result poured out of the charts, you just forget all that. You realize instantly how significant this is—what it is you’ve really landed on—and it’s great! From BBC TV program, Journeys in Time and Space: Invisible Universe (28 Feb 2001). No man that does not see visions will ever realize any high hope or undertake any high enterprise. Address, Convention Hall, Philadelphia (10 May 1915). In 'Text of President’s Speech: Tells New Citizens, They Must Think Themselves Only Americans', New York Times (11 May 1915), 1. 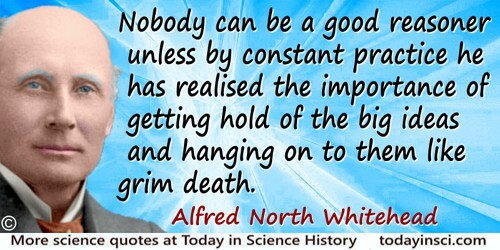 Nobody can be a good reasoner unless by constant practice he has realised the importance of getting hold of the big ideas and hanging on to them like grim death. Once human beings realize something can be done, they're not satisfied until they've done it. Cease Fire (1958). In Gary Westfahl, Science Fiction Quotations: From the Inner Mind to the Outer Limits (2006), 1. One of my surgical giant friends had in his operating room a sign “If the operation is difficult, you aren’t doing it right.” What he meant was, you have to plan every operation You cannot ever be casual You have to realize that any operation is a potential fatality. From Cornelia Dean, 'A Conversation with Joseph E. Murray', New York Times (25 Sep 2001), F5. One of the most impressive discoveries was the origin of the energy of the stars, that makes them continue to burn. One of the men who discovered this was out with his girl friend the night after he realized that nuclear reactions must be going on in the stars in order to make them shine. She merely laughed at him. She was not impressed with being out with the only man who, at that moment, knew why stars shine. Well, it is sad to be alone, but that is the way it is in this world. One stops being a child when one realizes that telling one’s trouble does not make it better. Diary entry for 31 Oct 1937, The Burning Brand: Diaries 1935-1950 (1961), 66. Physicists speak of the particle representation or the wave representation. Bohr's principle of complementarity asserts that there exist complementary properties of the same object of knowledge, one of which if known will exclude knowledge of the other. We may therefore describe an object like an electron in ways which are mutually exclusive—e.g., as wave or particle—without logical contradiction provided we also realize that the experimental arrangements that determine these descriptions are similarly mutually exclusive. Which experiment—and hence which description one chooses—is purely a matter of human choice. The Cosmic Code: Quantum Physics as the Language of Nature (1982), 94. Science develops best when its concepts and conclusions are integrated into the broader human culture and its concerns for ultimate meaning and value. Scientists cannot, therefore, hold themselves entirely aloof from the sorts of issues dealt with by philosophers and theologians. By devoting to these issues something of the energy and care they give to their research in science, they can help others realize more fully the human potentialities of their discoveries. They can also come to appreciate for themselves that these discoveries cannot be a genuine substitute for knowledge of the truly ultimate. Science has always promised two things not necessarily related—an increase first in our powers, second in our happiness and wisdom, and we have come to realize that it is the first and less important of the two promises which it has kept most abundantly. In 'The Disillusion with the Laboratory,', The Modern Temper (1929). Science is not the enemy of humanity but one of the deepest expressions of the human desire to realize that vision of infinite knowledge. Science shows us that the visible world is neither matter nor spirit; the visible world is the invisible organization of energy. The Cosmic Code (1982), 348. Stress: When you wake up screaming and you realize you haven’t fallen asleep yet. 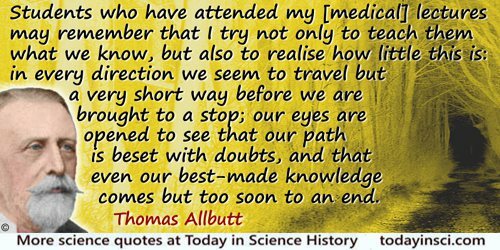 Students who have attended my [medical] lectures may remember that I try not only to teach them what we know, but also to realise how little this is: in every direction we seem to travel but a very short way before we are brought to a stop; our eyes are opened to see that our path is beset with doubts, and that even our best-made knowledge comes but too soon to an end. In Notes on the Composition of Scientific Papers (1904), 3. Study the science of art. Study the art of science. 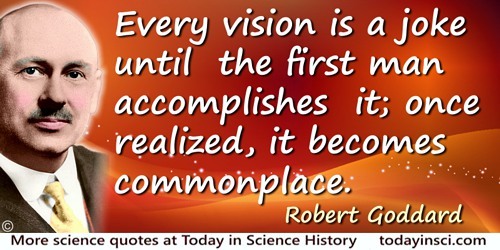 Develop your senses - especially learn how to see. Realize that everything connects to everything else. Suddenly, from behind the rim of the moon, in long, slow-motion moments of immense majesty, there emerges a sparkling blue and white jewel, a light, delicate sky-blue sphere laced with slowly swirling veils of white, rising gradually like a small pearl in a thick sea of black mystery. It takes more than a moment to fully realize this is Earth . . . home. Talent deals with the actual, with discovered and realized truths, any analyzing, arranging, combining, applying positive knowledge, and, in action, looking to precedents. Genius deals with the possible, creates new combinations, discovers new laws, and acts from an insight into new principles. Thanks to the sharp eyes of a Minnesota man, it is possible that two identical snowflakes may finally have been observed. While out snowmobiling, Oley Skotchgaard noticed a snowflake that looked familiar to him. Searching his memory, he realized it was identical to a snowflake he had seen as a child in Vermont. Weather experts, while excited, caution that the match-up will be difficult to verify. In Napalm and Silly Putty (2002), 105. The first thing to realize about physics ... is its extraordinary indirectness.... For physics is not about the real world, it is about “abstractions” from the real world, and this is what makes it so scientific.... Theoretical physics runs merrily along with these unreal abstractions, but its conclusions are checked, at every possible point, by experiments. 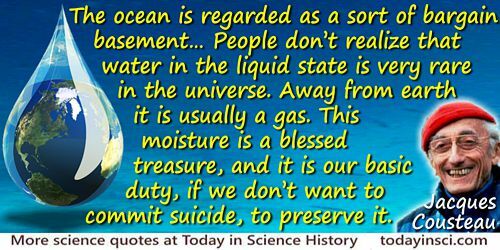 In Science is a Sacred Cow (1950), 60-62. The great age of the earth will appear greater to man when he understands the origin of living organisms and the reasons for the gradual development and improvement of their organization. This antiquity will appear even greater when he realizes the length of time and the particular conditions which were necessary to bring all the living species into existence. This is particularly true since man is the latest result and present climax of this development, the ultimate limit of which, if it is ever reached, cannot be known. Hydrogéologie (1802), trans. A. V. Carozzi (1964), 77. The ideal government of all reflective men, from Aristotle onward, is one which lets the individual alone–one which barely escapes being no government at all. This ideal, I believe, will be realized in the world twenty or thirty centuries after I have passed from these scenes and taken up my public duties in Hell. The landscape has been so totally changed, the ways of thinking have been so deeply affected, that it is very hard to get hold of what it was like before… It is very hard to realize how total a change in outlook Isaac Newton has produced. From 'Newton and the Twentieth Century—A Personal View', collected in Raymond Flood, John Fauvel, Michael Shortland and Robin Wilson (eds. ), Let Newton Be! A New Perspective on his Life and Works (1988), 241. The modern naturalist must realize that in some of its branches his profession, while more than ever a science, has also become an art. African Game Trails (1910), 17. The moment you encounter string theory and realise that almost all of the major developments in physics over the last hundred years emerge—and emerge with such elegance—from such a simple starting point, you realise that this incredibly compelling theory is in a class of its own. The only important thing to realise about history is that it all took place in the last five minutes. The present knowledge of the biochemical constitution of the cell was achieved largely by the use of destructive methods. Trained in the tradition of the theory of solutions, many a biochemist tends, even today, to regard the cell as a “bag of enzymes”. However, everyone realizes now that the biochemical processes studied in vitro may have only a remote resemblance to the events actually occurring in the living cell. Nucleo-cytoplasmic Relations in Micro-Organisms: Their Bearing on Cell Heredity and Differentiation (1953), 108. The realization that our small planet is only one of many worlds gives mankind the perspective it needs to realize sooner that our own world belongs to all of its creatures, that the Moon landing marks the end of our childhood as a race and the beginning of a newer and better civilization. Quoted in Nina L. Diamond, Voices of Truth (2000), 333-334. The young specialist in English Lit, having quoted me, went on to lecture me severely on the fact that in every century people have thought they understood the Universe at last, and in every century they were proved to be wrong. It follows that the one thing we can say about our modern “knowledge” is that it is wrong. The young man then quoted with approval what Socrates had said on learning that the Delphic oracle had proclaimed him the wisest man in Greece. “If I am the wisest man,” said Socrates, “it is because I alone know that I know nothing.” The implication was that I was very foolish because I was under the impression I knew a great deal. In The Relativity of Wrong (1989), 214. There are 60 sub-atomic particles they’ve discovered that can explain the thousands of other sub-atomic particles, and the model is too ugly. This is my analogy: it’s like taking Scotch tape and taping a giraffe to a mule to a whale to a tiger and saying this is the ultimate theory of particles. … We have so many particles that Oppenheimer once said you could give a Nobel Prize to the physicist that did not discover a particle that year. We were drowning in sub-atomic particles. Now we realize that this whole zoo of sub-atomic particles, thousands of them coming out of our accelerators, can be explained by little vibrating strings. Quoted in Nina L. Diamond, Voices of Truth (2000), 334. There are … two fields for human thought and action—the actual and the possible, the realized and the real. In the actual, the tangible, the realized, the vast proportion of mankind abide. The great, region of the possible, whence all discovery, invention, creation proceed, and which is to the actual as a universe to a planet, is the chosen region of genius. As almost every thing which is now actual was once only possible, as our present facts and axioms were originally inventions or discoveries, it is, under God, to genius that we owe our present blessings. In the past, it created the present; in the present, it is creating the future. In 'Genius', Wellman’s Miscellany (Dec 1871), 4, No. 6, 202. There is a clarity, a brilliance to space that simply doesn’t exist on earth, even on a cloudless summer’s day in the Rockies, and nowhere else can you realize so fully the majesty of our Earth and be so awed at the thought that it’s only one of untold thousands of planets. 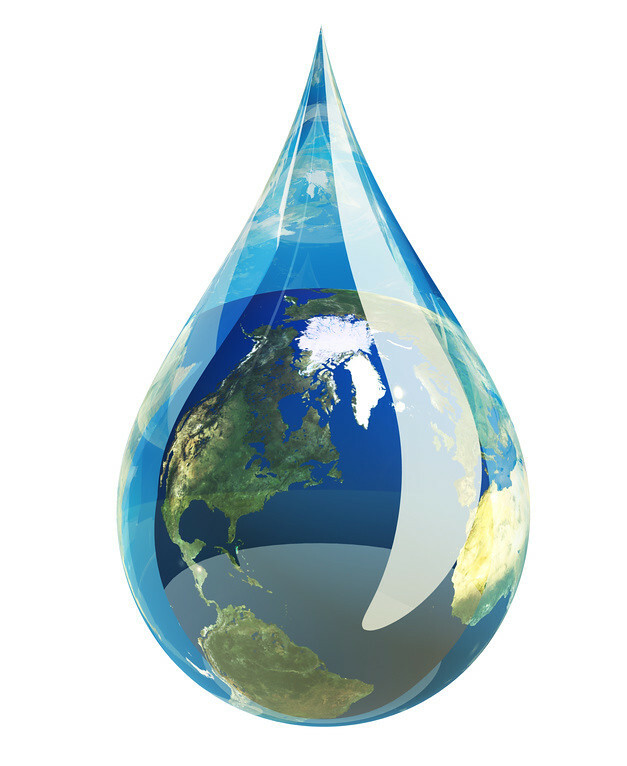 There is no drink like pure water, provided one realizes that it is alcohol that is the purifying agent. Aphorism as given by the fictional character Dezhnev Senior, in Fantastic Voyage II: Destination Brain (1987), 220. There is no failure for the man who realizes his power, who never knows when he is beaten; there is no failure for the determined endeavor; the unconquerable will. There is no failure for the man who gets up every time he falls, who rebounds like a rubber ball, who persist when everyone else gives up, who pushes on when everyone else turns back. Thinking consists in envisaging, realizing structural features and structural requirements; proceeding in accordance with, and determined by, these requirements; thereby changing the situation in the direction of structural improvements. In Productive Thinking (1959), 235. Thus will the fondest dream of Phallic science be realized: a pristine new planet populated entirely by little boy clones of great scientific entrepreneurs free to smash atoms, accelerate particles, or, if they are so moved, build pyramids—without any social relevance or human responsibility at all. To go to sea! 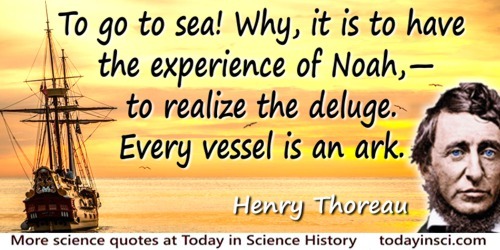 Why, it is to have the experience of Noah,—to realize the deluge. Every vessel is an ark. In Cape Cod (1866), 175. Today I am more than ever frightened. I wish it would dawn upon engineers that, in order to be an engineer, it is not enough to be an engineer. In Toward a Philosophy of History (1941), 103. Vagueness is very much more important in the theory of knowledge than you would judge it to be from the writings of most people. Everything is vague to a degree you do not realize till you have tried to make it precise, and everything precise is so remote from everything that we normally think, that you cannot for a moment suppose that is what we really mean when we say what we think. In The Philosophy of Logical Atomism (1918, 1919), 2. We are about to move into the Aquarian age of clearer thinking. Astrology and witchcraft both have a contribution to make to the new age, and it behooves the practitioners of both to realize their responsibilities and ob­ligations to the science and the religion. In Diary of a Witch (1969), 186. We are too ready to accept others and ourselves as we are and to assume that we are incapable of change. We forget the idea of growth, or we do not take it seriously. There is no good reason why we should not develop and change until the last day we live. Psychoanalysis is one of the most powerful means of helping us to realize this aim. In 'Dedication', American Journal of Psychoanalysis (1942), 35, 99-100. As quoted and cited in Milton M. Berger, Women Beyond Freud: New Concepts Of Feminine Psychology (2013). We knew that DNA was important. We knew it was an important molecule. And we knew that its shape was likely to be important. But we didn’t realise I think just how important it would be. Put in other words, we didn’t realise that the shape would give us a clue to the replication mechanism. And this turned out to be really an unexpected dividend from finding out what the shape was. From Transcript of BBC TV program, The Prizewinners (1962). We now realize with special clarity, how much in error are those theorists who believe that theory comes inductively from experience. In section 3, 'The Field Concept', Physics and Reality (1936), collected in Essays in Physics (1950), 28. We’re suffocating ourselves by cutting things down. And the awful thing is that the knowledge is there. Fifty years ago when we exterminated things, we did it without realising. Now there’s plenty of evidence of what it is we’re doing, and yet we keep on doing it. In Rowan Hooper, 'One Minute With… David Attenborough', New Scientist (2 Feb 2013), 217, No. 2902, 25. What it is important to realize is that automation ... is an attempt to exercise control, not only of the mechanical process itself, but of the human being who once directed it: turning him from an active to a passive agent, and finally eliminating him all together. In 'The Myth of the Machine,' The Pentagon of Power (1970). When the war finally came to an end, 1 was at a loss as to what to do. ... I took stock of my qualifications. A not-very-good degree, redeemed somewhat by my achievements at the Admiralty. A knowledge of certain restricted parts of magnetism and hydrodynamics, neither of them subjects for which I felt the least bit of enthusiasm. In What Mad Pursuit (1988). Whenever you note the time on the clock, realize that it is now—right now—later than it has ever been. As quoted in Douglas Martin, 'Kenneth Franklin, Astronomer, Dies at 84', New York Times (21 Jun 2007), C13. This was Martin’s concluding remark in a paper for the new millenium making clear it properly began not on in 2000, but on 1 Jan 2001. Will it be possible to solve these problems? It is certain that nobody has thus far observed the transformation of dead into living matter, and for this reason we cannot form a definite plan for the solution of this problem of transformation. But we see that plants and animals during their growth continually transform dead into living matter, and that the chemical processes in living matter do not differ in principle from those in dead matter. There is, therefore, no reason to predict that abiogenesis is impossible, and I believe that it can only help science if the younger investigators realize that experimental abiogenesis is the goal of biology. The Dynamics of Living Matter (1906), 223. You would be surprised at the number of academics who say things like ‘I didn’t realise what a sponge was until I saw a programme of yours’. Interview with David Barrett, 'Attenborough: Children Don’t Know Enough About Nature', Daily Telegraph (17 Apr 2011). [In mathematics] we behold the conscious logical activity of the human mind in its purest and most perfect form. Here we learn to realize the laborious nature of the process, the great care with which it must proceed, the accuracy which is necessary to determine the exact extent of the general propositions arrived at, the difficulty of forming and comprehending abstract concepts; but here we learn also to place confidence in the certainty, scope and fruitfulness of such intellectual activity. [Kepler] had to realize clearly that logical-mathematical theoretizing, no matter how lucid, could not guarantee truth by itself; that the most beautiful logical theory means nothing in natural science without comparison with the exactest experience. Without this philosophic attitude, his work would not have been possible. From Introduction that Einstein wrote for Carola Baumgardt and Jamie Callan, Johannes Kepler Life and Letters (1953), 13. [The original development of the Spinning Mule was a] continual endeavour to realise a more perfect principle of spinning; and though often baffled, I as often renewed the attempt, and at length succeeded to my utmost desire, at the expense of every shilling I had in the world. 'Extract from a manuscript document circulated by Crompton about the year 1809 or 1810', reprinted in The Basis of Mr. Samuel Crompton’s Claims to a Second Remuneration for his Discovery of the Mule Spinning Machine, (1868), 29. [Watching natural history programs] brings a solace you can’t describe in words. It’s because we’re part of it fundamentally…. In moments of great grief, that’s where you look and immerse yourself. You realise you are not immortal, you are not a god, you are part of the natural world and you come to accept that. Reflecting on the letters he received from newly bereaved people. While his series are running on TV, in dozens of letters daily (comprising the majority of the correspondence), they tell him that the only things they can face in their darkest moments are his natural-history programmes. From interview with Joe Shute, 'David Attenborough at 90: ‘I think about my mortality every day’', The Telegraph (29 Oct 2016). … (T)he same cause, such as electricity, can simultaneously affect all sensory organs, since they are all sensitive to it; and yet, every sensory nerve reacts to it differently; one nerve perceives it as light, another hears its sound, another one smells it; another tastes the electricity, and another one feels it as pain and shock. One nerve perceives a luminous picture through mechanical irritation, another one hears it as buzzing, another one senses it as pain… He who feels compelled to consider the consequences of these facts cannot but realize that the specific sensibility of nerves for certain impressions is not enough, since all nerves are sensitive to the same cause but react to the same cause in different ways… (S)ensation is not the conduction of a quality or state of external bodies to consciousness, but the conduction of a quality or state of our nerves to consciousness, excited by an external cause. Law of Specific Nerve Energies. “Half genius and half buffoon,” Freeman Dyson ... wrote. ... [Richard] Feynman struck him as uproariously American—unbuttoned and burning with physical energy. It took him a while to realize how obsessively his new friend was tunneling into the very bedrock of modern science. In Genius: The Life and Science of Richard Feynman (1992), Prologue, 4.